The France National football team were given a heroes' welcome as they returned on Monday afternoon from Russia following their World Cup final 4 - 2 win over Croatia. 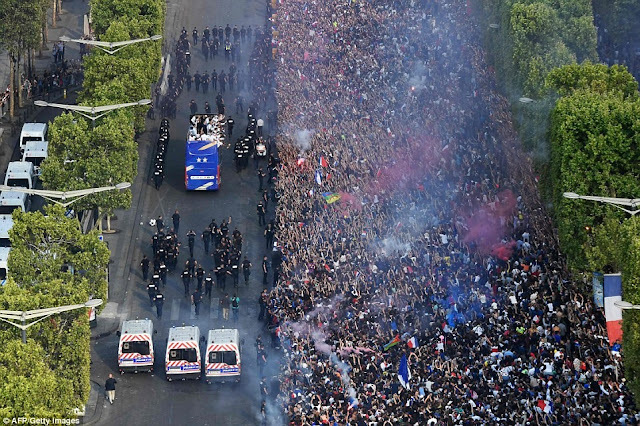 500,000 French fans were on the ground to receive the World Cup winners in Paris as they paraded down the famous Champs-Elysees avenue to celebrate their first World Cup win since 1998. The world cup winners later proceeded to the Presidential Palace where they celebrated with President Macron and France's first lady Brigitte Macron.